Vollrath 67137 Wear-Ever Straight Sided Aluminum Saute Pan with TriVent Chrome Plated Handle 7.5 Qt. TigerChef > Smallwares > Cookware > Aluminum Cookware >< Aluminum Saute Pans > Vollrath 67137 Wear-Ever Straight Sided Aluminum Saute Pan with TriVent Chrome Plated Handle 7.5 Qt. $36.83 Vollrath 67735 Wear-Ever Straight Sided Aluminum Saute Pan with TriVent Silicone Handle 5 Qt. $41.93 Vollrath 67737 Wear-Ever Straight Sided Aluminum Saute Pan with TriVent Silicone Handle 7.5 Qt. $21.29 Winco ASET-7 Winware Heayweight Aluminum Saute Pan 7-1/2 Qt. $29.40 Vollrath 67133 Wear-Ever Straight Sided Aluminum Saute Pan with TriVent Chrome Plated Handle 3 Qt. $34.80 Vollrath 67135 Wear-Ever Straight Sided Aluminum Saute Pan with TriVent Chrome Plated Handle 5 Qt. $31.38 Vollrath 67733 Wear-Ever Straight Sided Aluminum Saute Pan with TriVent Silicone Handle 3 Qt. $47.87 Vollrath 68733 Wear-Ever Classic Select Straight Sided Heavy Duty Aluminum Saute Pan with TriVent Silicone Handle 3 Qt. $80.49 Vollrath 68735 Wear-Ever Classic Select Straight Sided Heavy Duty Aluminum Saute Pan with TriVent Silicone Handle 5 Qt. $102.17 Vollrath 68737 Wear-Ever Classic Select Straight Sided Heavy Duty Aluminum Saute Pan with TriVent Silicone Handle 7.5 Qt. $20.99 Thunder Group ALSAP004 Aluminum Saute Pan 7 Qt. $24.99 Royal ROY SAUTE S 7 Heavy Weight Aluminum Shallow Saute Pan 7 Qt. $22.88 Winco AXST-7 Super Aluminum Saute Pan 7-1/2 Qt. $20.99 TigerChef Heavy Duty Aluminum Saute Pan 7 Qt. $17.13 Winco ASET-5 Win-Ware Aluminum Saute Pan 5 Qt. $16.99 Thunder Group ALSAP003 Aluminum Saute Pan 5 Qt. 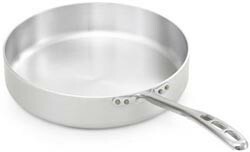 Use the Vollrath 67137 Wear-Ever Straight Sided Aluminum Saute Pan with TriVent Chrome Plated Handle 7.5 Qt. to cook a wide variety of specialty dishes. An excellent addition to restaurants, catering companies, and other food service facilities, this product is exceptionally durable and suited for high volume commercial use. Constructed from impact-resistant standard 8 gauge energy-efficient 3004 aluminum for rust- and corrosion-resistance as well as for efficient heat distribution, this kitchen essential will cook food quickly and evenly. For added convenience, this piece is built with a riveted-on handle for a secure grip. Durable, functional, and reliable, this NSF certified saute pan is an excellent option for high volume commercial food establishments.